If you have been off trick-or-treating and returned home with an embarassment of candy, what on earth can you do to mange the problem and sort it by brand? Yes, it’s an issue that so many of us have had to face at this time of year. 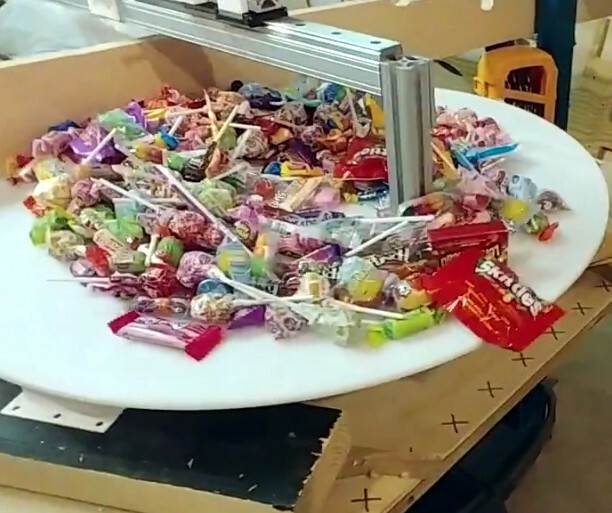 So much a challenge, that the folks at [Dexter Industries] have made a robotic candy-sorter to automate the task. OK, there’s something of the tongue-in-cheek about the application. But the technology they’ve used is interesting, and worth a second look. Hardware wise it’s a Lego Mindstorms conveyor and hopper controlled by a Raspberry Pi through the BrickPi interface. All very well, but it’s in the software that the interest lies. They use the Raspberry Pi’s camera to take a picture to send off to Google Cloud Vision, which they then query to return a guess at the brand of the candy in question. The value returned is then compared to a list of brands to keep or donate to another family member, and the hopper tips the bar into the respective pile. They provide full build details and code, as well as the video we’ve put below the break. So simple a child can explain it, sort of. Seems like just about every hackerspace eventually ends up with an old vending machine that gets hacked and modded to serve up parts, tools, and consumables. But why don’t more hackerspaces build their own vending machines from scratch? Because as [Ryan Bates] found out, building a DIY vending machine isn’t as easy as it looks. [Ryan]’s “Venduino” has a lot of hackerspace standard components – laser-cut birch plywood case, Parallax continuous rotation servos, an LCD screen from an old Nokia phone, and of course an Arduino. The design is simple, but the devil is in the details. The machine makes no attempt to validate the coins going into it, the product augurs are not quite optimized to dispense reliably, and the whole machine can be cleaned out of product with a few quick shakes. Granted, [Ryan] isn’t trying to build a reliable money-making machine, but his travails only underscore the quality engineering behind modern vending machines. It might not seem like it when your Cheetos are dangling from the end of an auger, but think about how many successful transactions the real things process in an environment with a lot of variables. Of course, every failure mode is just something to improve in the next version, but as it is this is still a neat project with some great ideas. If you’re more interested in the workings of commercial machines, check out our posts on listening in on vending machine comms or a Tweeting vending machine.